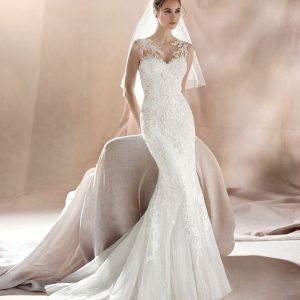 Marvelous wedding dress with an off-the-shoulder neckline and short sleeves. A lovely design in tulle and lace with thread embroidery over the entire dress. 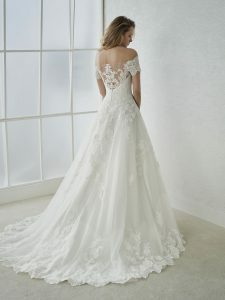 A design with an off-the-shoulder neckline and spectacular tattoo-effect back. A very feminine dress that combines the sensuality of the illusions with the elegance of the fabrics. Our sample is in beautiful condition and is a uk 14 and is in Ivory.